Home / News / Social Media / MIAA chief Monreal on the alleged thief from Filipino deportees: "Nakakalungkot lang at nadungisan nanaman ang imahe ng NAIA..."
MIAA chief Monreal on the alleged thief from Filipino deportees: "Nakakalungkot lang at nadungisan nanaman ang imahe ng NAIA..."
MIAA General Manager Ed Monreal saddened on another incident in NAIA. Image credit to Manila Bulletin and File Photo. 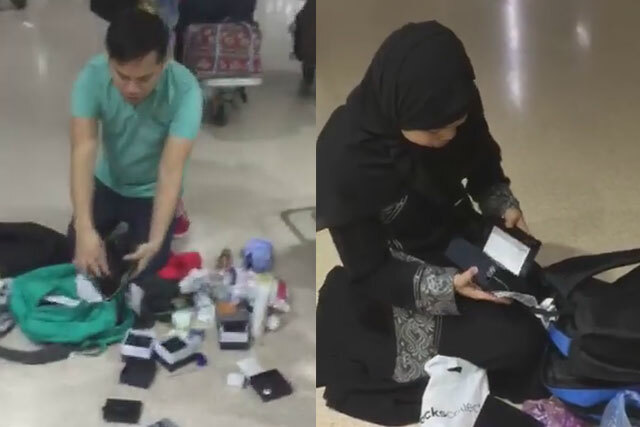 Viral video of the deported Filipino workers from Jeddah, Saudi Arabia went viral last week, which results in another thief case in the Manila International Airport. The video was from Mah Fe Moskila, one of the victims. 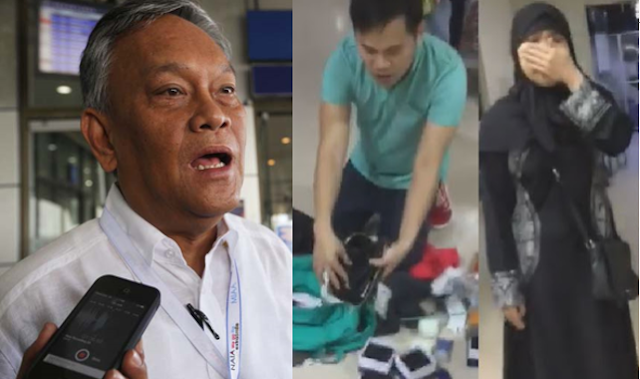 Based on the video that has been trending in social media, baggage materials of the OFWs in NAIA was seen scattered on the floor. "Deported kase kami kaya bawal kami magdala ng gamit. Kahit po, kahit medyas po ay pinapaalis dun sa Jeddah." Moskila said. "Eh ang nangyari po, naubos po ang alahas ko. Pati iPhone ko, mga relo ko po wala na pong laman." he added. Moskila even asked help from President Duterte. "President Duterte, tulungan niyo po kami. Deported na nga po kami, wala na po kaming natira sa pinaghirapan namin. Inubos po nila President", Moskila said. According to some netizens that commented on the video, usually deportees are not allowed to bring anything way back home. Also, Overseas Filipino Workers are not sure where exactly they lost their personal belongings. The viral video of Moskila went rounds online. In an official statement from MIA General Manager Ed Monreal said, he was saddened that this kind of incident once again happened in NAIA. And with through investigation, MIA finds no irregularities in the baggage handling of the Filipino deportee from Jeddah, Saudi Arabia. 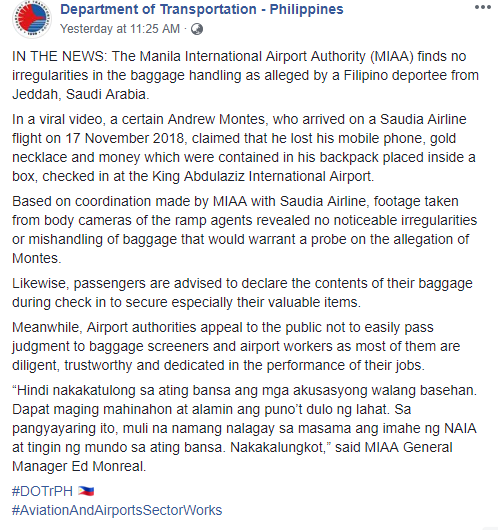 Manila International Airport Authority (MIAA) coordinated with the Saudi Airline and according to the footage taken from body cameras of the ramp agents revealed no noticeable irregularities or mishandling of baggage that would warrant a probe on the allegation of Montes. “Hindi nakakatulong sa ating bansa ang mga akusasyong walang basehan. Dapat maging mahinahon at alamin ang puno’t dulo ng lahat. Sa pangyayaring ito, muli na namang nalagay sa masama ang imahe ng NAIA at tingin ng mundo sa ating bansa. Nakakalungkot,” said MIAA General Manager Ed Monreal. "IN THE NEWS: The Manila International Airport Authority (MIAA) finds no irregularities in the baggage handling as alleged by a Filipino deportee from Jeddah, Saudi Arabia. 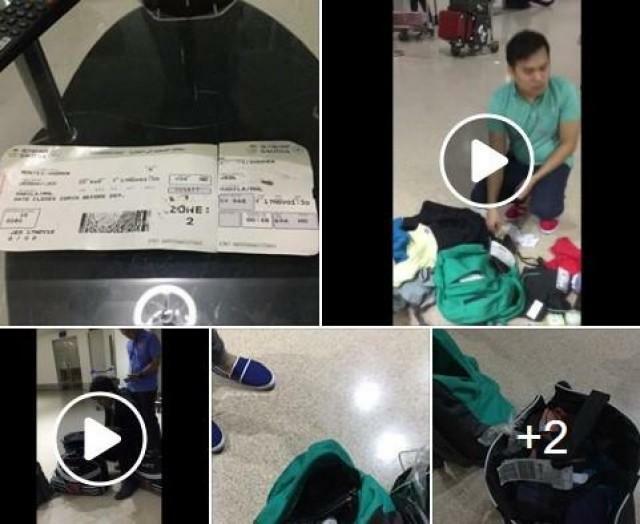 In a viral video, a certain Andrew Montes, who arrived on a Saudia Airline flight on 17 November 2018, claimed that he lost his mobile phone, gold necklace and money which were contained in his backpack placed inside a box, checked in at the King Abdulaziz International Airport. Based on coordination made by MIAA with Saudia Airline, footage taken from body cameras of the ramp agents revealed no noticeable irregularities or mishandling of baggage that would warrant a probe on the allegation of Montes. Likewise, passengers are advised to declare the contents of their baggage during check in to secure especially their valuable items. Meanwhile, Airport authorities appeal to the public not to easily pass judgment to baggage screeners and airport workers as most of them are diligent, trustworthy and dedicated in the performance of their jobs.